In blender or food processor, place vinaigrette ingredients. Cover; blend or process 15 to 20 seconds or until smooth. Pour into 2-cup liquid measuring cup. Cover and refrigerate up to 2 days. Let stand at room temperature about 1 hour before serving. In large bowl, stir together apples, celery and cranberries. Divide evenly among 8 lettuce-lined salad plates. Top each salad with cheese and walnuts. Serve with vinaigrette. *To toast walnuts, heat oven to 350°F. Spread walnuts in ungreased shallow pan. Bake uncovered 6 to 10 minutes, stirring occasionally, until light golden brown. 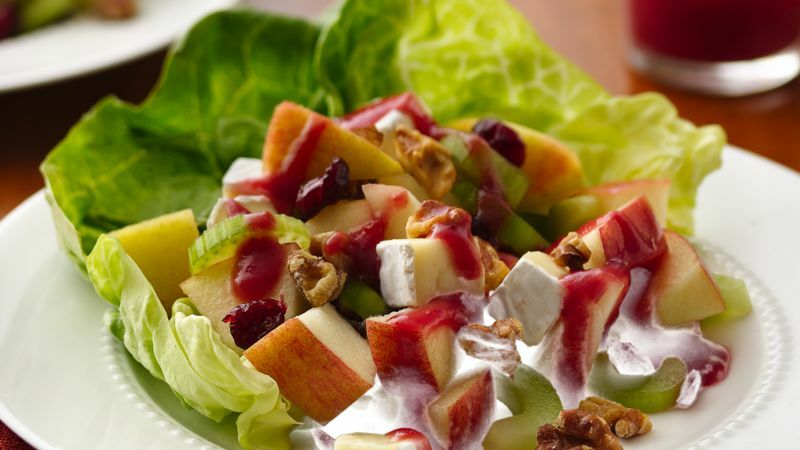 Opt for cut-up pears instead of the apples, or a combination of both. Keep apples from browning by tossing cut-up fruit with a bit of orange juice.